Ray-Bar’s fire-rated, 5/8" lead lined sheetrock (type RB-LBG) is the first and original U.L. Labeled and Classified Fire Rated Lead Backed Drywall and Partition System to meet U.S. and Canadian Safety Standards for 1 hour and 2 hour fire-rated partition applications with pure lead sheet meeting Federal Specification QQ-L-201 F, Grade C and ASTM B749-85, Type L51121 factory laminated under pressure to the back side of the gypsum panel. Our lead backed drywall is custom manufactured to customer specifications and is typically available in one day. RB-LBG labeled Fire Rated Lead Backed Gypsum Board (RB-LBG), shielding components, and related wall systems or partitions assemblies are tested in accordance with ANSI / UL 263, ASTM E119 and NFPA 251 "Fire Tests of Building Construction and Materials" and Canada's CAN / ULC-S101 "Standard Methods of Fire Endurance Tests of Building Construction and Materials" on gypsum board panels meeting ASTM C1396 and in compliance with all currently applicable UBC and IBC building code requirements (see complete marking on product). 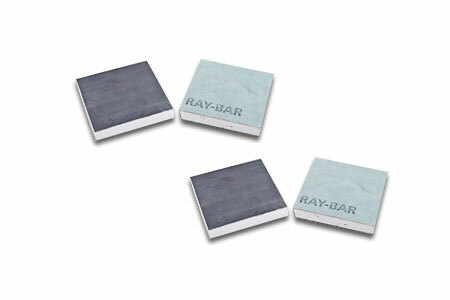 Ray-Bar offers more combinations than any other manufacturer, with over 7 different wall board types where two or more protective aspects are required, such as x-ray protection/fire-resistant and moisture-resistant, mold-resistant, abuse-resistant, security, or other applications available as required or specified by your project architect. Click here for the Lead Thickness Chart.